Nearly 33,000 Americans died on U.S. roadways last year, a figure that has gradually declined in recent years. In certain states, however, fatality tallies are headed in the opposite direction. Updated data for 2014 published by the National Highway Traffic Safety Administration last week provides a detailed portrait of the prevalence of various types of fatal crashes and where they’re occurring. Over the year, Vermont (-36 percent) and New Hampshire (-30 percent) experienced the largest declines in traffic fatalities. Meanwhile, Wyoming recorded 150 fatalities in 2014 after the number of lives lost there had plummeted to just 87 the prior year. New Mexico's 383 traffic fatalities similarly marked the deadliest year for the state since 2007. Many factors can push a state’s traffic deaths up or down in a given year. One often-cited factor is the economy since roads are more filled with people commuting to and from work or traveling for pleasure in good economic times. Anne McCartt, senior vice president for research at the Insurance Institute for Highway Safety, points out that drops in the unemployment rate generally coincide with increases in traffic fatality rates. State laws, too, play a role in preventing traffic deaths. Primary seatbelt laws, which enable law enforcement officers to ticket drivers absent any other infractions, promote seatbelt usage. The role of seatbelts in saving lives is well documented: Those not wearing seatbelts accounting for nearly half (49 percent) of passenger vehicle occupant deaths in 2014. “It’s those riskier drivers who aren’t buckling up where even small changes in seatbelt use can have a big effect on fatalities,” McCartt said. Helmet laws have further been shown to be effective in curbing motorcyclist fatalities. A number of states also raised maximum speed limits in recent years, and NHTSA reports that speeding is a factor in one in four traffic deaths. The weather in a state can also influence traffic deaths over the course of a year. Heavy snowfall may lead to more accidents, but fewer fatalities actually occur usually with not as many vehicles on roadways and motorists tending to drive slower, McCartt said. Warmer weather, on the other hand, tends to encourage more walking, biking and other modes of travel. 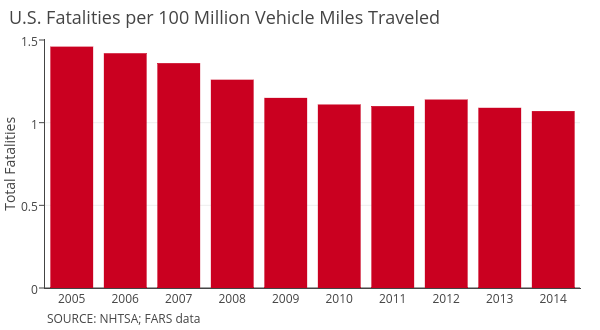 Last year, national traffic fatality totals remained nearly unchanged from 2013. 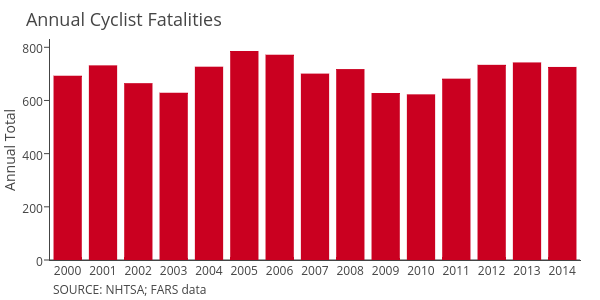 Early estimates for 2015 suggest traffic fatalities have ticked back up. NHTSA projects that 16,225 people were killed in the first half of this year, an 8.1 percent jump from 2014 that’s higher than any national tally over the first six months since 2009. In a news release, NHTSA cited job growth and lower fuel prices as two potential drivers of increased traffic deaths. For a look at 2014 traffic deaths in each state, we’ve compiled data from NHTSA’s Fatality Analysis Reporting System. State-level totals frequently fluctuate over one-year periods; it's necessary to review multiple years of data to detect longer-term trends. Across states, it was a particularly deadly year for pedestrians in Alabama. Ninety-six pedestrians died (up from 59 in 2013), the highest tally since at least 1994. Alaska (14 fatalities), New Mexico (74 fatalities) and Washington (75 fatalities) also experienced recent annual highs that increased more than 50 percent over the prior year. Nineteen states recorded year-over-year declines, but most don’t appear to be indicative of any longer-term trends. One state that experienced marked improvement last year is Minnesota, where pedestrian fatalities fell by more than half. Nationally, pedestrian deaths now account for 15 percent of all traffic deaths. The number of motorcyclists killed declined for the third straight year in 2014. But the 4,586 fatalities still represent a significant increase from the 1990s, when there were fewer than 2,500 deaths annually. In California, motorcyclist fatalities have increased each of the past five years to 519 deaths in 2014. States recording notably fewer deaths last year include Oklahoma, where fatalities declined from 92 in 2013 to 57, and Minnesota, which recorded about a quarter fewer fatalities. As a share of all traffic fatalities, motorcyclist deaths were most common in Hawaii (26 percent), Connecticut (22 percent) and Nevada (22 percent). NHTSA noted that motorcyclist fatalities are far higher in states without strong helmet laws. Nineteen states and the District of Columbia require all motorcyclists to wear helmets, while most other states maintain laws requiring only some motorcyclists to wear them. Warmer weather also likely plays a role as people spend more time riding bikes. Motorcycle totals include mopeds, off-road motorcycles and other motorized bikes. In 2014, cyclist fatalities dipped 2.3 percent after climbing each of the previous three years. Nineteen cyclists were killed on Pennsylvania roadways, up from 11 in 2013 and 16 in 2012. States with significantly fewer cyclist fatalities last year from prior totals include Ohio and Oklahoma. Florida recorded 139 fatalities -- the highest nationally -- and far more than New York (46) and Texas (50). While cyclists make up a very small share of all commuters, their numbers have grown across urban centers. Efforts around cyclist and pedestrian safety have gained traction in cities, some of which have launched "Vision Zero" and other initiatives to improve safety.